I’ve been dabbling in high dynamic range (HDR) photography since 2005, when Adobe released Photoshop CS2 and the “merge to HDR” command. The big challenge with HDR in Photoshop has always been the tone-mapping step. Tone-mapping is where you tell the software how to squish the 32-bit/channel (HDR) image into a 16-bit/channel color space. Tone-mapping controls not only the global image contrast, but also local contrast (micro-contrast) between adjacent tones. I’ve seen a lot of bad attempts at tone-mapping, and part of the reason is that the on-board Photoshop tools just aren’t very easy to use. While there are lots of HDR software options available today, I have always gravitated towards using Photomatix Pro (www.hdrsoft.com) for my images, because I was able to get good results for my natural landscapes. In October, 2010, Nik Software released HDR Efex Pro, a plug-in for Photoshop/Lightroom/Aperture that performs HDR tone-mapping. I like both programs, so here’s a quick comparison and review. Both HDR Efex Pro and Photomatix Pro are available as plug-ins for Photoshop, Lightroom, and Aperture. Photomatix Pro is also available as a stand-alone application, and it supports drag and drop file loading (which is very convenient). 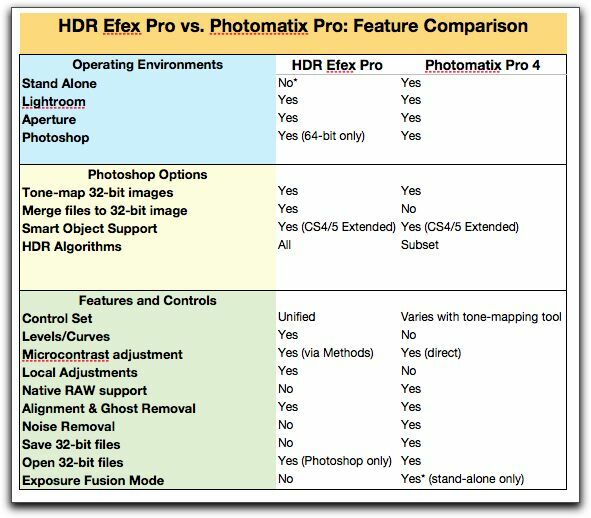 You can run HDR Efex Pro as a stand-alone program, too, but it is not designed with this workflow in mind. Both HDR Efex Pro and Photomatix Pro support 32-bit smart objects with Photoshop CS4/5 Extended. HDR Efex Pro does not currently operate within 32-bit versions of Photoshop (you need CS4 or higher on PCs, CS5 on Macs, and a 64-bit OS). 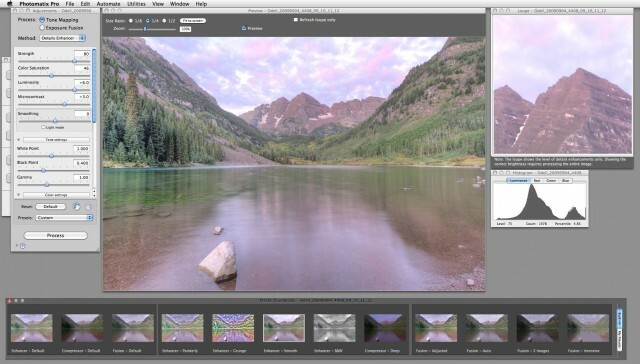 Nik Software has announced that an update to offer 32-bit Photoshop support is due in early 2011. Nik Software has applied a unified graphical user interface for HDR Efex Pro. All of the controls are within the same window, as are image previews, histograms, and preset thumbnails. Photomatix uses a multiple menu approach to its interface, and sometimes you can accidentally bury menus underneath other windows on your computer screen. With HDR Efex Pro, the tool set remains the same regardless of the tone-mapping options you choose. The tools are slider-based, and will be very familiar to anyone who has used other Nik products (or any other image editor, for that matter). The Photomatix controls are also slider-based, but the controls themselves differ between tone-mapping modules. For example, you get a different set of controls when choosing between the Tone Mapping and Exposure Fusion options, and still another set of controls when you choose between the Details Enhancer and Tone Compressor options within the Tone Mapping module. 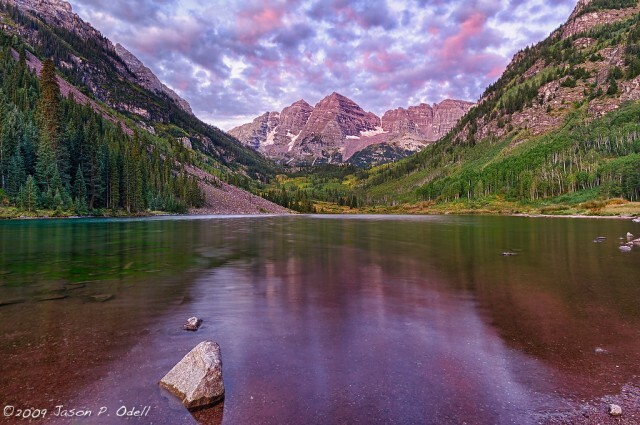 Users will need to spend more time learning the Photomatix controls to properly fine-tune their images. One thing I do like about the Photomatix controls, however, is that they are “sticky.” In other words, when you open the application, the control sliders are default to your last used settings. This is useful when you are working with panoramic images and you want to apply identical tone-mapping settings across numerous files. The Photomatix Pro 4 interface is modular, with multiple windows. HDR Efex Pro offers a couple of controls that Photomatix does not. First, you get a levels and curves tool. For advanced users, this is a great tool for adjusting image contrast and color. Second, HDR Efex Pro users gain selective adjustments via Control Points. For those unfamiliar with Nik Software’s U Point technology, Control Points are a way of making “smart” selections within your image without the need for brushes or masks, and they work remarkably well. This feature alone may make the price of HDR Efex Pro worth it– you gain a tremendous workflow advantage by being able to make local adjustments to your image without having to change software applications. HDR Efex Pro users can modify color, brightness and contrast on local areas quickly and easily without leaving the plug-in interface. Lastly, HDR Efex Pro gives the user a vignette effect tool to create interesting creative looks. Photomatix Pro offers three primary options for working with merged images. In Exposure Fusion mode, images are blended together to preserve highlight and shadow details, but a 32-bit intermediate image is not used. This method is great for producing “natural” images that don’t scream “HDR.” Exposure Fusion is my go-to method for HDR landscapes when I use Photomatix Pro, but it is not available in the Photoshop plug-in version of the software. Photomatix users can also perform true 32-bit Tone Mapping, and have two different options to choose from: Details Enhancer and Tone Compressor. Both options have numerous controls that allow the user to customize their HDR experience. Unfortunately, the control set differs depending on which tool you use. I tend to prefer the Details Enhancer tool when using Photomatix in Tone Mapping mode, but experimentation is usually best to find what works for you. The default settings for Photomatix Pro offer a very flat, low-contrast image that will require some tweaking to get a final product. HDR Efex Pro only performs 32-bit tone-mapping (no “fusion” mode), but it offers users 20 different HDR Methods. HDR Methods are a combination of different tone-mapping and microcontrast algorithms, and each one can be modified via a strength slider. Some of the HDR Methods have intuitive names (Natural), while others can seem confusing (Gradual Large). I recommend finding a few Methods that you like, and then getting to know them well. One thing I learned the hard way: Preview your tone-mapped image at 100% before you save it. The preview window in “fit to window” mode is not accurate at showing the microcontrast effects and you can easily overdo it if you aren’t paying close attention. The default settings of HDR Efex Pro provide a very natural, realistic look out of the box that does not need much adjusting (if you want a realistic image). Both HDR Efex Pro and Photomatix Pro come with a set of tone-mapping presets. HDR Efex Pro offers 32 presets, but many of them are so image-specific as to be poor starting points for a wide range of images. Photomatix Pro offers 12 presets, but many of them are so “over the top” that I wouldn’t use them except to get an idea of how the different control sliders affect an image. Both applications allow you to create your own presets, which is something I would recommend doing. Tony Sweet and I have created a set of 14 free presets for HDR Efex Pro which we feel offer better jumping-off points for just about any image. With each of these programs, performance will depend on what options you choose and what environment you run it in. I did some comparisons using my Mac Pro (2010) model (Single 3.33GHz Xeon Processor with 6 total processor cores and 12 GB RAM). I loaded the same set of 5 TIFF images (12MP, 16-bit) into each application. In the case of the applications running in Photoshop, times include the full set of steps required to obtain a tone-mapped image– for Photomatix Pro, this means using Photoshop’s Merge to HDR Pro option before launching the plug-in. Only HDR Efex Pro offers built-in image merging from the Photoshop plug-in. 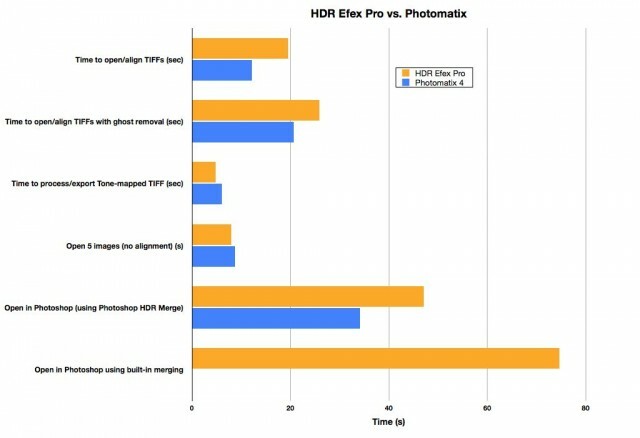 HDR Efex Pro vs. Photomatix Pro 4. Shorter bars are faster. As you can see from the chart above, application performance is fairly comparable when using the applications in stand-alone mode. HDR Efex Pro is slightly slower when using image alignment and ghost removal options, but not so much as to be an issue. HDR Efex Pro is much slower when using its built-in 32-bit file merge option within Photoshop; Photomatix Pro requires that you use Photoshop’s merge to HDR feature first. Despite minor differences in application performance, you also should consider overall workflow when choosing image editing software. In my opinion, this is one of the biggest differences between the two programs. When I use Photomatix Pro, I find that I got the best control over my results by sending my tone-mapped images to another application (usually Capture NX2) for final processing. This is because Photomatix lacks some of the tools that I like to use in my everyday image editing, like Levels/Curves, sharpening, and other effects. For me, tone-mapping my images in Photomatix was simply the first step in a multiple application workflow. With HDR Efex Pro, I’ve found that I can get a 95% solution directly within the application. Many of my HDR images only need a final round of sharpening to be completely processed. This saves time in the long run, because I can get the look I want right up front, whether it’s natural, grunge, or black and white. Does this mean that I couldn’t get these looks from Photomatix? Absolutely not. It’s just that I find the HDR Efex Pro control set to be far more user-friendly than the Photomatix control sliders. Add in the ability to do local adjustments with Control Points, and you have a soup to nuts solution for HDR image processing. One other note about workflow: Photomatix Pro allows you to save 32-bit “radiance” images directly from its stand-alone application. This is a useful feature if you want to share 32-bit files with others. HDR Efex Pro does not offer this option, but will open radiance files if you use it within Adobe Photoshop. 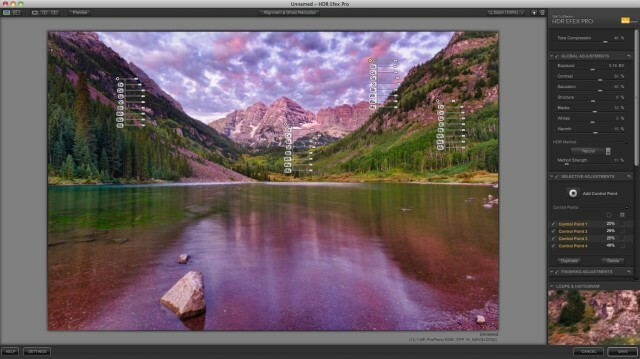 Photomatix Pro (standalone) offers a built-in RAW converter. You can send it RAW files directly and have it process them. However, it is a best practice to use your own RAW converter and batch out 16-bit TIFFs for tone-mapping; you’ll have more control over features such as color, contrast and lens distortion correction. Photomatix Pro also offers built-in noise reduction algorithms, which can be very useful in removing shadow noise from high ISO images. With all HDR tone-mapping programs, you’ll quickly discover any noise or dust in your images, so be prepared to do a little sensor cleaning! Photomatix Pro and HDR Efex Pro are both fantastic applications for creating stunning high dynamic range images. I can highly recommend both products in terms of the results they are capable of delivering. That being said, I find myself using HDR Efex Pro more and more these days. I think that’s because the Nik developers designed HDR Efex Pro as a creative tool with controls that most creative photographers will be comfortable with. The Photomatix controls are more “technical” in flavor– something that engineers might easily understand but might confuse the average photographer. Because HDR Efex Pro offers a nearly complete self-contained workflow, it makes it easy for me to do almost all my image editing within its boundaries rather than just use it to create “starting point” images. My only beef with HDR Efex Pro in its current form is that it really isn’t designed for stand-alone use. 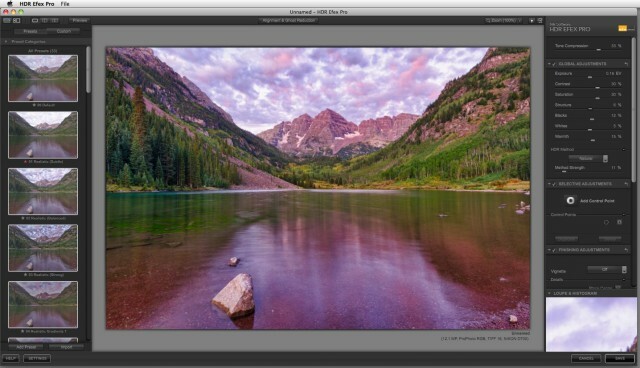 The Photomatix interface is much easier to use as a stand-alone product; HDR Efex Pro is meant to be used with Bridge, Lightroom, or Aperture as the front-end interface. Photomatix Pro is available from www.hdrsoft.com as a stand-alone application for $79 or as a Photoshop plug-in for $119 (includes stand-alone). HDR Efex Pro is available from www.niksoftware.com and includes Photoshop/Lightroom and Aperture versions for $159.95. Get the definitive guide to HDR Efex Pro here. If you’re planning to buy HDR Efex Pro, why not save 15% off all Nik Software products (USA only) with this link? Great post! I will put a link on my site hdr360pro.com. Also, I was very impressed with your and Tony’s HDR images in the new book gallery! Great review. Totally agree. I have both, both are very powerful but I find myself using more and more HDR EFex Pro. While I usually dissapointed with the net result out of Photomatix and see the need to “finish” the image in Photoshop, with HDR Efex Pro the image is 99% finished and the rest I usually Finish in Aperture. Great review, and worth the read. I too find myself using HDR Efex Pro more in my workflow. While Photomatix has long been the first step in my HDR workflow HDR Efex Pro offers better blending with wide contrast exposures. I often take my images beyond the natural look using Nik’s Color Efex Pro, or other Nik Software, it is a consistent jumping off point. I wrote you an e-mail about using HDR Efex Pro as a stand alone since I only use NX2. Well, I tried it as per your suggestion as a free trial. It works! Slowly, but it works. I have worked in it until the free trial ran out. What fun. Nice results. I am sure that I would have benefited greatly from your book, so that I could have learned more and therefore done more with it. You are a great source of information for me, thanks for doing what you do! I use both, but like others I am finding U-Point more and more to be my method of choice. HDR Efx Pro just sort of works naturally for me now, just like NX2 and the entire NIC plugins I added to Aperture. Now my workflow is a mess (jumping between NX2 and Aperture), but like a messy desk, I know where everything is and it works for me. I would recommend HDR Efx Pro to anyone and if you are a NIK user and don’t have it, it is worth the $160 to add it to your available control set. Also, your HDR Book was a HUGE help! i purchased HDR Efex Pro from a third party vendor and have been unable to use it with CS5 Extemded. Numerous calls to Nik technical support have been unproductive and technical support finally washed its hands of the problem. Because i purchased it from a vendor other than Nik, I was unable to obtain a refund. very disappointed because even Nik admitted they were having problems with Photoshop CS5/Mac OSX compatibility and the fact they wouldn’t allow allow the refund. I tried both of these applications out before HDR Efex was released and what sold it to me was the U-Point controls. I do next to no additional editing in Photoshop thanks largely to this technology and the ability to selectively adjust sections of images. For me, the interface and layout for HDR Efex made more sense and I’ve been very happy with my purchase. One other fun trick that I use with HDR Efex (it bloats file size but I don’t mind) is to open the raw files through Bridge into HDR Efex and save as a Smart Object. One the editing in HDR Efex is done, convert the SO into a new SO (this retains the 32 bit color space in the Smart Object) then I convert the document to 16 bit for additional editing. If you need to tweak the HDR, just open the smart object and it is still there as a Smart filter you can edit and adjust. When you are done, save the .psb, close it, the updates come back into the 16 bit file where you can continue editing. This was a really well written article, I wish it had been out before I bought, but it probably wouldn’t have changed my decision. Great write up! Photomatrix allows you to batch process multiple scenes which can come in handy. In HDR efex you can only process one at a time. I know real estate photographers like using the batch mode in photomatrix. I’m sorry to hear of your problems. You can save 32-bit Smart Objects if you use Photoshop, which gives you non-destructive access to the HDR Efex Plug-in. I’m sorry to hear of your problems. I’m using HDR Efex with Mac OSX/CS5 without trouble. However, you should be asking the vendor for a refund, not Nik, since it was they who sold you the product. If the vendor does not offer product refunds, then you have a case for the BBB. I have been using Photomatix now for over a year and have developed a quick and easy work flow with it. I particularly enjoy the batch processing feature for hdr work shot in the same light. I have not yet tried HDR Efex but if it is slower that would be a major setback in my work flow. I am however in the spot adjustment capability. The price difference is substantial also. In my work flow I batch to do Photomatix then process the results in Lightroom 3 and finish the work in Photoshop. I would never consider finishing an image without processing it in Photoshop because of the ability to paint my curve adjustments with a pressure sensitive Wacom tablet. I also do tweaking of sharpen and noise as well as other color balancing techniques that I can’t go into here. I can not understand the mindset behind eliminating Photoshop as the definitive correction tool. There is still nothing that does a better job for refining your work. Plug ins are always going to be additional tools for me. Good points, Barry. The Control Point Feature in HDR Efex Pro gives you the ability to do the localized curves adjustments you describe (just not using curves) while still in 32-bit HDR mode. If you enable Smart Objects, you can go back and re-do the HDR tone-mapping at any time, provided you save a copy of the file in 32-bit mode. Thanks for the insite in your review. I have been impressed with the ease of use of HDR Efex Pro and the results. I’ve not experienced any crashing problem with (PC i7 platform) Lightroom 3.3 and HDR Efex Pro. I purchased my copy from an approved vender (not NIK). I did have minor installation issues with updates to the Complete Collection which I found the NIK folks very responsive and got quick resolution of the issue. A decent review, although I think there is too much emphasis placed on Photoshop as an “operating environment”. I used DPHDR for a few years and recently switched to Photomatix. Although DPHDR had all kinds of excellent features, Photomatix really shines in terms of results – I get consistently excellent images from Photomatix. In fact, after using it for only a couple of months, I fee that I have a real winner on my hands for five broad reasons: 1) fair price; 2) sensible interface that puts functionality first; 3) ability to install outside Photoshop as a standalone application; 4) rock solid stability, and; 5) stunning results. Frankly, if you take away, fair price, functionality, stability, or results from any piece of software, my sense of satisfaction disappears. ACDsee Pro and Photomatix together give me pretty much everything I need in Photographic processing, workflow and collections management for less than the price of Photoshop. Beyond all that, I love how well Photomatix handles my RAW files. So, I would need a very compelling new features or ability not available in Photomatix to consider a switch, and the same holds true for ACDsee Pro. My photographic workflow is quite satisfying as it stands. I did a test of 4 sets of images and processed them in both Photomatix and NIK HDR efex Pro. Three out of 4 images came out better in Photomatix. All but 1 of the images processed by HDR Efex Pro had significant posterization. Has anyone else had this problem with HDR Efex Pro? If so, do you know what causes it and what to do about it? It’s easy to over-do the Method Strength in HDR Efex Pro if you only rely on the “fit to window” image preview. Always check at 100% zoom before you hit Save. Can you batch process with HDR EFEX Pro in Photoshop? No, it’s a single-image editor. I have both and use them with Lightroom on a liquid cooled PC with a SSD and 12G ram. I admit EFEX is very intuitive and has a Viveza control point built in, but its speed doesn’t begin to compare with Photomatix’s batch processing of bracketed or single photos. I can take one group of three or one single photo and tweak it just the way I want and then go to Photomatix Batch process, select a folder with 120 or more RAWs. I select Previous and it applies all those settings to the next 40 groupss or 120 singles. It takes a little while, but I can busy myself elsewhere. Some times I may want to go back and redo a set. This is infinitely faster than processing 40 separate groups in EFEX. People seem to really like the far out Grunge in Photomatix even if it is very grainy. EFEX can’t come close to this extreme HDR effect. I love Viveza 2 but prefer Photomatix for HDR. This article aroused my interest in using HDR as a way of squeezing a higher dynamic range in a natural way, and I am naturally drawn to HDR Efex Pro because I have been using Capture NX since it first came out – and of course I have your CNX2 eBook – and selection points have become essential to me. I have read your Efex Pro eBook, and seen the first of the two videos, and have been experimenting for the demo period, but I have one question. Since I have CNX2, I have to decide in which product to make local adjustments, and I thought that Efex Pro would probably be the better choice, except for one thing. Once I have saved my final masterpiece prior to sharpening and fine tuning in CNX2, it seems there is no way of re-loading that version into Efex Pro in order to have some second thoughts at a later date, as of course I can do with CNX2. Is this really true, and if so, isn’t this rather a limitation of the whole process, and one which, for CNX2 users at least, rather nullifies the benefits of the Local Adjustment points? Or I am wrong? Your point is absolutely valid. However, the same problem exists for people who use HDR Efex Pro (or any Nik plug-in, for that matter) with Lightroom, Aperture, or Photoshop Elements. The only way to preserve the control points, etc. with the Nik plug-ins is to use them as Smart Filters from Photoshop. In the case of HDR Efex Pro, that means producing a 32-bit/channel Smart Object layer. This is one reason why Color Efex Pro 3 is so simple to use in CNX2– it’s non-destructive. Yes, you can use it as a stand-alone, with some caveats. It works just fine this way. I think it depends on what features and style you’re after. While you can use both Photomatix and HDR Efex Pro as stand-alone programs, only Photomatix is really designed as a stand-alone app. In my opinion, I prefer the HDR Efex Pro interface, controls, and output for making HDR images that don’t go too far “over the top.” IMO, the Photomatix controls are somewhat non-intuitive, and they differ depending on what mode you’re in. On the other hand, Photomatix has the “exposure fusion” option that HDR Efex Pro lacks. There are always going to be pros and cons, but I think HDR Efex Pro offers a richer set of features for the “stand-alone” user who doesn’t want to fiddle with Photoshop. You can also consider getting Adobe Elements, which can be used as a host application for either program, and it is available at a reasonable price.